Elia Kazan once said that he started making good movies only after On the Waterfront. 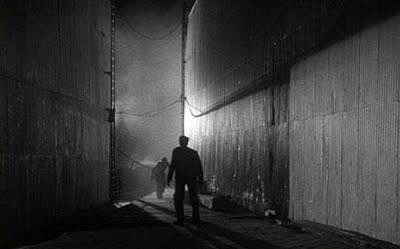 He also said that an earlier effort, his terrific 1950 noir thriller Panic in the Streets was the closest thing he made to a perfect picture. We tend to agree -- the movie transcends its genre and its style. The movie has the feel of an independent picture, portraying America as a melting pot of hardworking immigrants, and social problems as too complex for easy solutions. Kazan's film is possibly the best noir in Twentieth Century Fox's docu-drama style of the late 1940s. Director Kazan adapts his superior dramatic staging to new and authentic settings. The effort to stem an outbreak of deadly contagion paints a nervous portrait of an unstable society; the threat to America crosses all boundaries and all social classes. Suspense builds to a high pitch of as Richard Widmark's frantic health official searches for the source of the disease that could easily kill hundreds of thousands. A murdered man found on the New Orleans waterfront is discovered to be carrying pneumonic plague, an airborne variety of bubonic plague and twice as deadly. Federal health official Dr. Clinton Reed (Richard Widmark) has a tough time convincing the municipal authorities that drastic measures are needed to isolate the contagion before it can spread. 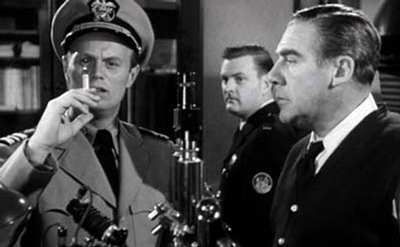 Police Captain Tom Warren (Paul Douglas) is at first unimpressed by Reed's alarm, and grudgingly lends his expertise to tracking down whoever killed the infected man. The biggest problem is to keep the investigation a secret so that the infected murderers don't flee the city. Meanwhile, the scope of the police manhunt convinces criminals Blackie and Raymond Fitch (Jack Palance and Zero Mostel) are that the dead man was hiding something big, and try to force the brother of the murdered man to talk. The brother is already seriously ill - Blackie and Raymond are unknowingly spreading potential death wherever they go. This is Elia Kazan's breakout film, his transitional picture between being primarily a stage director and a director of movies that move. His impressive noir Boomerang! was shot on real locations, but most of the action was confined to interior scenes. On this film Kazan and his writers balance Dr. Reed's stable home life with the wild manhunt in the city's older district and on its teeming waterfront; at one point they fly out to a ship at sea. Even the bad guys are unusually credible. Intimidating menace Walter Jack Palance (in his first movie) runs a Laundromat as a front for his crooked schemes. Still shaking his persona as the vicious killer Tommy Udo from Kiss of Death, Richard Widmark plays an ordinary guy burdened with a tremendous responsibility and very little authority. He must use persuasion to get cooperation at all levels of the investigation. The clever screenplay gives his Dr. Reed a beautiful introduction - the office calls him at home, and as he talks to his wife Nancy (Barbara Bel Geddes) he puts on a uniform. As we don't yet know what his job, we assume that he's a Naval officer. Dr. Reed isolates the germ and then hands the gathered authorities (who actually show up for the meeting - what kind of city is this?) the messy problem. The police resent bearing the responsibility for turning the city upside-down on the say-so of just one doctor, who has already had the murdered man's body and all its evidence cremated. Widmark and Paul Douglas make a great pair of mismatched companions on an almost hopeless search. On the other side of the law, the intense manhunt convinces Blackie and Fitch that there's some kind of deal they can muscle in on. 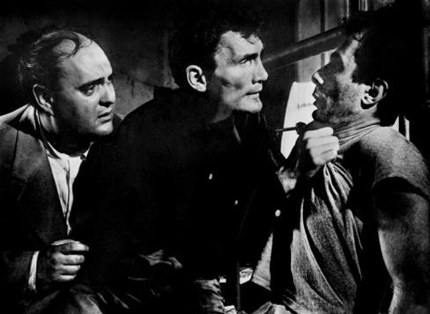 The hulking Jack Palance intimidates and cajoles his easily frightened partner, especially well played by Zero Mostel. Their scene in the Laundromat makes one wonder why Mostel didn't have a long dramatic career... until one learns that he was blacklisted from films just one year later. The portly Mostel impresses us with his energy in a number of action scenes. He's so active that one must look closely to see him being cleverly doubled in a twelve-foot jump in a coffee warehouse. The film's non-Hollywood image of the underworld is refreshingly convincing. Most everybody we meet has something to hide, including a doctor that Blackie finds to tend a sick man. When the authorities arrive the medico does a fast fade... all of these people are so slippery. Sixty years before Steven Soderbergh's harrowing Contagion, we take special notice each time a character touches another or breathes too closely ... we 'feel' the disease spreading even when we can't see it. Panic in the Streets creates an unusual noir sensibility that operates on political lines. Doc Reed criticizes a city official for thinking only locally about the responsibility to stem the plague; a germ can now spread as fast as modern trains and airplanes can carry people about. In a free society, destructive elements like Blackie are as hard to control as a disease run wild. The issue of human rights seems a secondary concern when the Police Captain sees the momentary need to have a reporter held incommunicado: breaking the story might start a panic. In Japanese thrillers like High and Low, the press and the cops set careers aside in the best interest of the city. In 1950 New Orleans, nobody expects any such cooperation. When one of the Mayor's aides excuses himself to evacuate his own family from the city, Widmark turns to Douglas and says, "Here we go ..."
Panic in the Streets is a desperate manhunt for a foreign invader, an undocumented alien killer. Part of the story seems to advocate the need for draconian measures or martial law - as Charlton Heston says in Touch of Evil, "A policeman's job is only easy in a Police State." Plague carriers Palance and Mostel are forever being compared to vermin, explicitly so in the movie's famous (if a bit too overtly symbolic) final scene. The need to protect society against monstrous invaders encourages over-anxious critics to propose Panic in the Streets as a right-wing allegory about Communists. Gordon Douglas' science-fiction monster thriller Them! is often considered a deliberate allegory. The defenders of America in both movies do the same things: sweep the city, break rules, and secretly imprison individuals that might jeopardize the mission. The giant ants in Them! are ruthlessly incinerated, while the disease carried by the criminal scum in Panic in the Streets transforms them almost literally into human rats in need of extermination. Either way, the impression given in many genre thrillers of the early 1950s is that America is under attack from within, and needs to defend itself. Richard Widmark's son is played by Tommy Rettig, soon to be ten of The 5,000 Fingers of Dr. T. Widmark makes for a great husband and father and his scenes with Barbara Bel Geddes are superb. She's conceived neither as 'the wife' nor as a supportive ornament, as is James Stewarts missus in Henry Hathaway's Call Northside 777. The many local non-actors in the cast blend seamlessly with the real locations, with the occasional soon-to-be familiar face (like Emile Meyer of Sweet Smell of Success and Alexis Minotis of Land of the Pharaohs) fitting in perfectly. 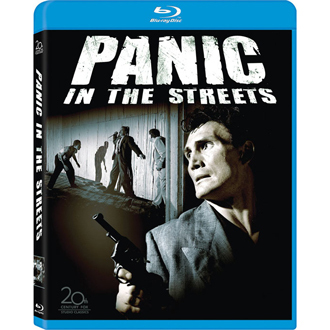 Fox Home Entertainment's Blu-ray of Panic in the Streets is an acceptable release, quality wise. It's a repackaging of a disc prepared for last year's special Elia Kazan box. HD of course adds some definition and stability, but the image is not an enormous improvement over the DVD released eight years ago. Around chapter 9, the picture loses sync for about five minutes. I played it on one machine and checked several times to convince myself that the fault is with the disc and not the player. The extras repeat Alain Silver and James Ursini's excellent audio commentary from the earlier Fox Film Noir DVD release, in addition to TV bio shows on both Jack Palance and Richard Widmark.